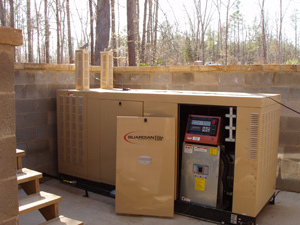 Power system installations for Raleigh, Durham, Chapel Hill, and the Greensboro areas of North Carolina. Successful installations require insight as to the functionality and aesthetics of the finished product before it ever begins. Whether integrating a system into an electrical structure which already exist or starting from scratch, the finished product should exist in the install companies head before the trucks ever leave the shop. Aesthetics is just as an important part as is the functional parts of an electrical system. Systems should blend into the background so that they become part of their surroundings. Quite a bit of experience is necessary to create system installations which are both successful aesthetically and functionally. You should look for companies who specialize in power systems and with experiences over thousands of systems. Click on either of the images to the right and look over just some of the considerations which have to be made for successful system installations. Attention to detail and commitment to quality is our reputation which has been built over thousands of units since 1995.